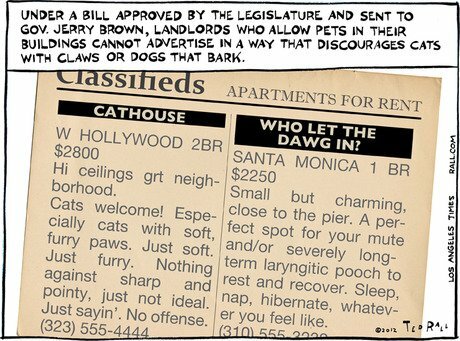 Earlier this week, California Governor Jerry Brown signed a law that makes it illegal for landlords to refuse to rent to tenants with pets that have not been devocalized (debarked) or declawed. The Golden State is the first in the nation to implement such legislation. A similar bill was vetoed by then-Gov. Arnold Schwarzenegger in 2010. Landlords who violate the law could face a $1,000 fine; the law does not, however, make it illegal for landlords to adopt a “no-pets” policy. Pavley introduced the bill, SB 1229, which was co-sponsored by the Humane Society Veterinary Medical Association (HSVMA) and The Paw Project. Declawing is where the last joint of a cat’s toe is severed — not unlike cutting off a human’s finger at the top knuckle. Devocalizing is surgical procedure where tissue or folds are removed from a dog or cat’s vocal cords to mute their barking or meowing. Declawing and devocalization are considered inhumane by several animal-rights organizations, and are even illegal in some countries. In Israel, for instance, declawing a cat can result in a $20,000 fine and jail time. Stateside, devocalization is illegal in Massachusetts and New Jersey.